Just like humans, turtles will become obese if they consistently consume more calories than they expend. As the fatty tissues in your turtle’s body expand, the tissues put increased pressure on his internal organs. This raised pressure reduces the performance of his organs and compromises his overall health. An early symptom of obesity in turtles is the inability to withdraw all of their extremities simultaneously. Additionally, you can examine the soft areas near your turtle’s neck, armpits and groin area; if soft tissue billows outward, your turtle is likely obese. If either of these signs is present, see a veterinarian to develop a prudent, calorie-restricted diet. Ensure that your turtle gets enough exercise; by providing a large and complex habitat, you will encourage your pet to exhibit natural foraging behaviors. Provide a varied diet, but refrain from feeding animal proteins to herbivorous species, which can cause nutritional problems in addition to obesity. Weigh and measure your turtle frequently, and use this data to help you and your veterinarian keep your pet healthy. 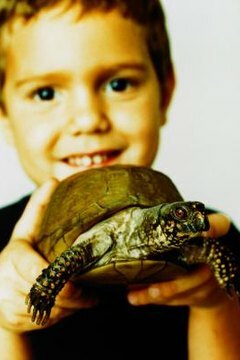 University of North Carolina at Chapel Hill: On Feeding Turtles: When and How Much?